Earliest serious British attempt to map the area around Shanghai, China. Surveyed by 'Chinese Gordon' during the Taiping Rebellion. 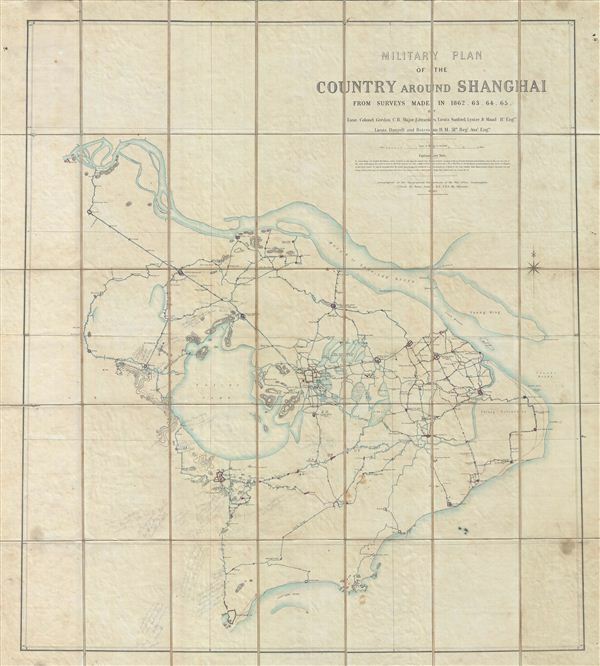 Military Plan of the Country Around Shanghai from Surveys Made in 1862, 63, 64, 65. An extremely scarce 1865 case map illustrating the country around Shanghai, China. This map, by British military officer Charles George Gordon (a.k.a. 'Chinese Gordon'), covers from the mouth of the Yangtze River south to the Tsien Tan River (Fushun River), Hangchao (Hangzhou), and from Ching Keang (Zhenjiang) to the Tunsha Banks, including all of the country in between, the Grand Canal, Shanghai, Soo Chow (Suzhou), Tai-Hu Lake (Tai Lake), Hoo Chow (Huzhou), and numerous other cities, lakes, and rivers. This plan was originally drafted by Lieutenant-Colonel Gordon while leading the Qing Chinese 'ever Victorious Army' against the pseud-Christina Taiping Rebels between 1862 and 1865. The manuscript plan drafted by Lieutenant Colonel Charles George Gordon and his Chinese assistants apparently covered an area of over 80 square meters. Following the defeat of the Taiping Rebellion in 1864 the map was zincographed at the Topographical Department of the War Office in Southampton england, then under the direction of Colonel Henry James. This enormous map was in turn reissued in the same year, the present example, on a reduced scale by the prominent London map publisher edward Stanford. The present example includes various manuscript annotations in a very light pencil. Though these could be very easily erased we have left them as they may well be of some historical value. Most are difficult to decipher, but those that are readable seem to include annotative descriptions of the villages, peoples, and terrain. The markings thus suggest that this example of Gordon's map may have been used as a basis for additional studies of this region in the later 19th century. Gordon's map of the vicinity of Shanghai, here presented on case format dissected and mounted on linen, is exceptionally rare with no known examples appearing on the retail market in the last 30 years. We have also identified only two copies in institutional collections, compared to which the present example is superior. A once in a lifetime find for the serious Shanghai collector. Charles George Gordon (January 28, 1833 - January 26, 1885) was a British army officer and colonial administrator active in the second half of the 19th century. Gordon was born in Woolwich, London, to a longstanding military Family. He studied at the Royal Military Academy at Woolwich where he excelled in mathematics and engineering. He was subsequently commissioned in 1852 as a second lieutenant with the Royal Engineers. At the outbreak of the Crimean War he was sent to Balaklava where he distinguished himself in a number of battles. Following the war he was assigned to the international commission to survey the new border between the Russian and Ottoman Empires. Seeing his future abroad, Gordon the volunteered for service in China. Gordon arrived in China in the midst of the pseudo-Christian Taiping Rebellion, one of the bloodiest conflicts in history. In 1862 Gordon was given charge of the Qing Imperial Chinese forces, called the "Ever Victorious Army". Gordon led the Ever Victorious Army in numerous decisive battles throughout southern China. Though in command of only about 5000 soldiers, Gordon's sophisticated tactics won nearly every battle, often against vastly greater numbers, earning him the moniker "Chinese Gordon". To honor his achievement, the Qing Emperor promoted Gordon to the rank of Titu ("Chief Commander of Jiangsu province"), decorated him with the imperial yellow jacket, and raised him to Qing's Viscount of second class. The British Army promoted Gordon to Lieutenant-Colonel and he was made a Companion of the Bath. Following his exploits in China Gordon was reassigned to the Ukraine and ultimately to Khartoum, where he accepted a post as the Governor-General of Sudan. Gordon held this post until the Mahdist Revolt, where he was slain in the battle later known as the Fall of Khartoum, in which the Mahdi's forces overwhelmed the city's defenses. Gordon himself was beheaded by the Mahdi, most likely after he was killed, and displayed on a tree as an object lesson to "enemies of Islam". Gordon has been memorialized in numerous monuments, a University in Australia, a painting by George W. Joy, and an effigy at St. Pauls Cathedral in London. Very good. Minor stains here and there. Dissected and mounted on linen. Some light pencil annotations that could be erased by may be of historical importance. Comes with original linen slipcase. Mossman, S., General Gordon's Private Diary of his Exploits in China; amplified by Samuel Mossman, (London) p. 208-209.